Former champion two-mile chaser Master Minded erased the memory of last month’s Cheltenham disappointment with a brilliant performance in the day’s feature race, his eighth success at Grade One level. The step up in trip to two and a half miles certainly brought about a revival, and Master Minded, amazingly allowed to start at the generous odds of 11/2, destroyed a quality field in imperious fashion, taking command hard on the bridle at the third last and powering away to beat last year’s winner Alberta’s Run by nine lengths. Master Minded was the forgotten horse in the race, but bookmakers were quick to price him up for the three-mile King George VI Chase at Kempto n - Hills make him 4/1 second-favourite, but you can get 6/1 with Paddy Power and 8/1 with Victor Chandler - and Paul Nicholls confirmed that the Boxing Day cracker will be his first priority next season. Nicholls said: “That was brilliant, and we now have a new horse to take on Long Run. I probably should have run Master Minded in the Ryanair Chase at Cheltenham instead of the Champion Chase, where he was flat to the boards all the way and made that horrible mistake two out because he was trying to keep up. “Kauto Star has been to Kempton and got the video and t-shirt, so now it is Master Minded’s turn. He is next year’s horse, and, though he is still probably the best two-mile chaser in England, it’s clear that he now needs this longer distance and he’ll have his prep race for the King George over two and a half miles at Ascot in November. “All credit to Ruby (Walsh) - I thought that he was lying too far out of his ground, but he knew just what he was doing. Dan Collins, who rides out Master Minded at home, assured me yesterday that the horse was in better form than before Cheltenham, and he has been proved right. Jockey Ruby Walsh was delighted with Master Minded, who bounced back to his best to win the John Smith’s Melling Chase. “Paul (Nicholls) trains them and I ride them - I manage to get it right and sometimes I manage to get it wrong,” said Walsh. “They went a really good gallop and it was a competitive race. He travelled lovely in behind them and really came on the bridle strongly when we turned out of the back. “It was probably a case of not going too soon on him but he picked up really well going to the last, jumped it well, and quickened all the way to the line. 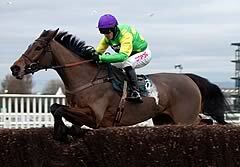 “It was a disappointing run at Cheltenham but, in hindsight, two miles is just a little bit sharp for him nowadays. He wants to go further and I would imagine that the King George would be his target now for next year. “He was very good over two and a half miles today and he wasn’t that good over two miles last time, so you have to try him over further. From riding him today, I think that he will get three miles but you won’t know until you actually go and race over three miles. “You probably won’t know if he stays (three miles) until (the King George VI Chase) at Kempton but it seems the natural progression - if he doesn’t stay, he can come back for the Ryanair Chase. Somersby could spice the mix in next season’s King George VI Chase at Kempton on Boxing Day after a fine third behind winner Master Minded in today’s John Smith’s Melling Chase. Trainer Henrietta Knight said: “I’m very happy with him and thought he ran a great race – probably the best race he’s run this season, and don’t forget he was the youngest horse in the field.